The average rating for all maps is -228,851.2 . Visit the official thread of Map #2000! Once again, I would like to congratulate BWMN for obtaining such a high status, and I look forward to reporting on map number 3000! BWMN is such a successful map database, but it is also much more than that. It has grown to become a supportive community among gamers and map makers alike. I would personally like the thank you, Panschk, for all of your hard work and dedication to make BWMN what it is today, and I have confidence in your ability, along with all the other map makers of this community, to uphold this site's reputation in the future. BWMN F-T-W! Well it's been a little while since the last motw, but here it is, better late than never! A fairly longtime member now, TKTKVROOM, who grew from 10 minute mapping noob to the increasingly improving mapper you see now, tk has tried over and over to get a MOTW, now please congradulate him for finally winning! Kumba (1.1) is a two player map with corner mains, a fairly standard layout. Kumba's uniqueness comes in its presentation, it forms a nice balance of open and tight areas, and has both highground and lowground battlefields. The map features use of inverted and enlarged ramps, as well as custom decoration, often in the form of rocks or mud closer to other terrain than is standard. A map which obviously took some time and dedication to create, Kumba is a nice addition to our MOTW collection. Spam the thread here, download melee here, and obs here. Ok, a light turnout in the motw thread. The votes were fairly unanimous, with Space in Hell by RaDiX and Nasty's Elevated Hate getting some of the love too. Salazar Slyherine bagged another MOTW with his map Antarctic Diary! A decievingly simple looking map, Antarctic Diary uses a few nice concepts to liven up a standard map. Nothing too radical, so there's no worry about having to adjust to a crazy map. Antarctic Diary uses cut in half tree doodads (I think that's what they are) to influence the miner ai. I'm sure you get annoyed when your scv decides to walk in a stupid path instead of going straight to the cc, well these doodads (although if you're not careful could get in your way) get in the way of the miners, so that they take a different path, which happens to be a much faster, straighter path. Don't worry, your favourite mannerpylon strat still works, the doodads don't interfere with building placement at all. The nat is overlooked by an unuseable cliff, so don't fret that tanks will camp you :) The nat has plenty of room behind it for unit movement or turret/cannon placement. The map has a fairly simple layout with just nat and mineral only expos besides the mains. The middle is fairly open, with some tighter areas, forming that nice balance and allowing for nice gameplay. Nightmarjoo's competition, with the theme Arctic Cityscape has gone on forever, it's time it be closed down! Honestly, all the maps posted here are pretty good, I'll say something about each one. 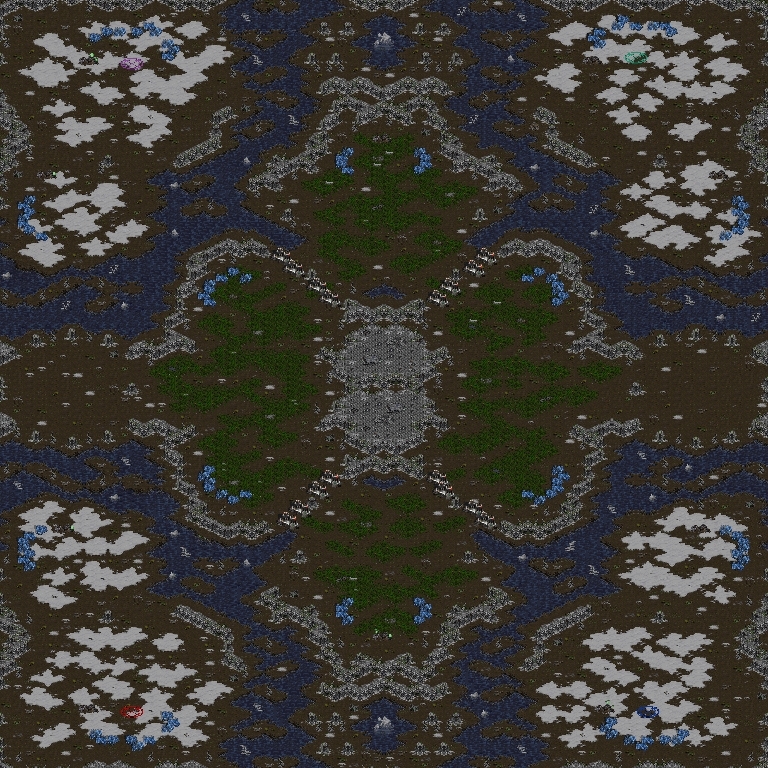 Urzatron's Winterheart, a nice map, and the first one made for the competition. I would say it's his best map for sure. The map started the competition with a great usage of compound/neutral buildings to really illustrate the theme I had in mind. 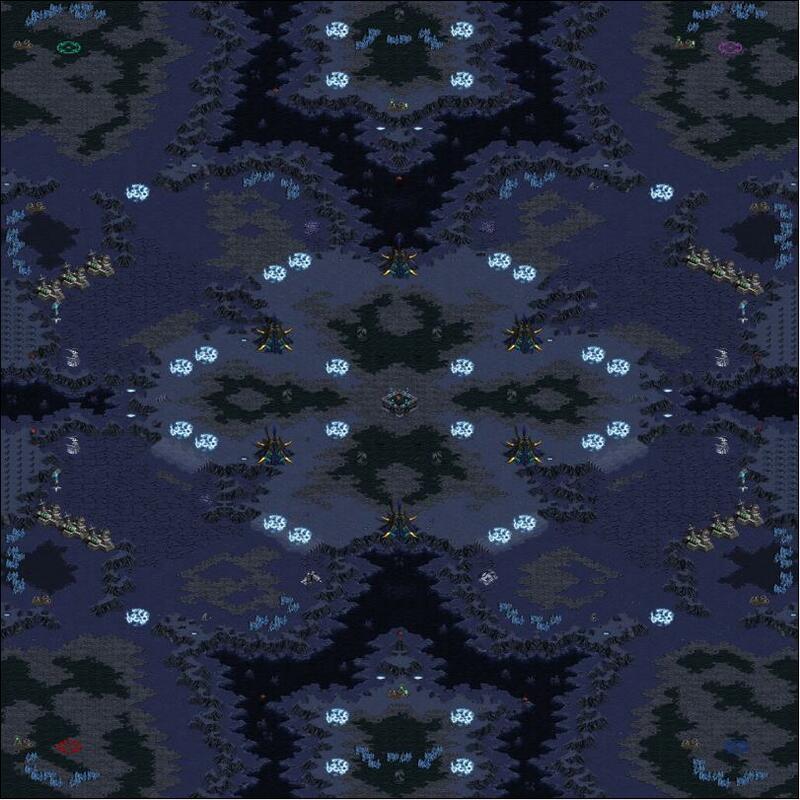 The map features a nat which zerg can't take with one hatch and defend the main with it, but it includes a backdoor mineral only with a mineral wall exit; sure to encourage some interesting gameplay :) Nice job, Urzatron. EffectiveHypnotize's HappyGuardianDay, the second great map the competition. It uses a nice blend of a city-like compound area and a natural looking snowy area, again nicely illustrates the theme. The neutrals used all create a nice maze of paths to maneuver through, making the map not too tight at all. This map also was the (excuse me if I overlooked something) only one which mentioned Happy Birthday, one of the original themes of the competition^^ Nice job, Hypnotize. Hypnotize made another map for the competition, Shevlin. This map probably illustrates the theme the poorest, but is still a nice map :) The map features a unique alternative path layout. Next was PsychoTemplar's Surtica. It used compound quite a bit, and used a nice neutral city for clutter; this makes an interesting map for if you need a more open battleground you have to blast it open yourself :D The map also uses a backdoor, blocked by a neutral. The nats have two entrances, lazy macro players will have to watch out here^^ Nice job templar. LostTampon made the map, achu!, er I mean Sneezed :) The map uses the theme in the form of compound forts used for alternate paths. The map has tight alternate paths with an open middle, and fairly vulnerable expos, sure to have nice gameplay, nice job LostTampon. The winner of the competition is Antares' Metal Age! An interesting island map which places the main islands around a mainland divided by neutral walls. This map surely portrays the theme, with compound and neutrals all over the mainland^^ The map is not unique in its use of a nat in the island main, but is unique in its relatively standard approach. Players can choose either island tactics or land tactics using the mainland, and can opt for early pressure or to macro it out with the easily obtainable nat. Any mapper's dream, Metal Age blends both attractivity with gameplay. Congradulations Antares! MOTW number one of the new year has been decided outside of the site, a fairly unanimous decision was made to make the revolutionary map (4)Avatar motw! The map players like a normal 4 player map for the most-part. A big difference is that the nat, the first expo does not cover the choke, but instead has its own choke blocked by neutral buildings. Past the main choke is a mineral only which players could take first and block the main choke, however it does not cover the choke the way the standard nat does. Outside of the nat with gas is rocky ground so you can't cannon in, sink in, bunker in, or through whatever method blockade the expo with buildings. Past the beginning expos is a rather open middle, it being blessed with possibly pathing killing neutrals for who knows what strategical value. In the north and south are island expos with plenty of room to build on/land on etc. Now the revolutionary aspect of the map. Permamently placed, Disruption Webs! If you're a starcraft retard, these spells (called dwebs for short) prevent all ground units inside the spell from attacking. Units can cast spells within and air units can attack above them. Can you imagine the strategical advantage to these? Manage to attack your enemy while they're on the webs and you probably just won that fight. Get unlucky enough to be attacked while yourself being on there and you're fucked. The dwebs at the main choke allow for easy defense if you position defense correctly, enemy units couldn't attack without trying to run through the narrow choke. Also, if you hold a scout in there it is invulnerable to melee units. If you build something there melee units couldn't attack it. There is so much you can do with these dwebs it's amazing. A fairly standard map combined with these dwebs and neutral buildings, LostTampon's Avatar is a map revolutionary, combining the standard with the future of mapping. Endless combinations of strategies can evolve in this map.